This page will walk through the basic steps necessary to start the Reprise GAUSS Floating Network License Manager (RLM) on the machine which you are using as the license server. It is assumed that GAUSS has already been installed on this computer and that you have received your Floating Network license file from Aptech. Note: If you are updating from an earlier version of GAUSS/GAUSS Engine for Windows, please click here before proceeding. IMPORTANT! Delete the temporary.lic file that comes with GAUSS from your GAUSSHOME directory. The GAUSS installation directory for this example is C:\gauss. Your GAUSS installation directory may be different. Start GAUSS on the License Server by using your Desktop Icon. 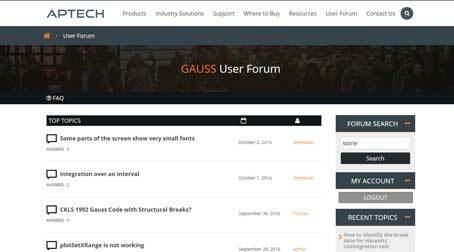 If GAUSS does not start, click here. Test that GAUSS is installed correctly and the license manager is working by checking to see what license type/license ID GAUSS is using by clicking on Help -> About GAUSS. If GAUSS is using the temporary license that ships with it, you will see a license ID that is all zeroes. If it is using the permanent license, it will be a 10-digit number that starts with 1. Set up RLM as a Windows Service - To set up RLM as a new Windows service, follow the instructions here. - To set up RLM as a system service on Linux that starts automatically at system boot time, see the RLM 12.1 License Administration Manual for an example of a script for that purpose. Note: Failure to set up GAUSS as a Windows or System Service requires that the Reprise License Manager (rlm) be manually restarted each time that GAUSS is started. See step 4 under 'Setting up the License Server' above on how to manually restart the rlm. ​Rename GAUSS Executable. Change the name of the 'gauss' executable to 'gaussapp'. Permissions. Make sure everyone has execution permission for this file. Verify that the rlm has been manually restarted. See step 4 under 'Setting up the License Server' above on how to manually restart the rlm. and make sure it matches what is in your GAUSS license file. To diagnose and resolve your error, see Common Floating Network Problems.